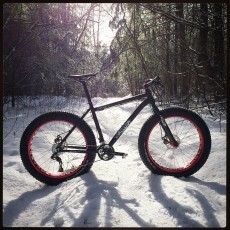 So I finally had a chance to take one of the new Framed fat bikes out for some real world, real snow testing. With a lot of early season snow this year and a noticeable increase in fat bike traffic in Boston Lot the trails were in prime condition. Made from 6061 aluminum and decently equipped with SRAM X7 shifters/derailleurs and BB7 brakes this bike with pedals weighs in at just a hair over 33 pounds. One of the first things I noticed about the bike is that it looks much more expensive than the $1350 price tag, shinny anodized parts can have that effect. A couple observations from the trail are this bike rides a little short, this caused me to be a little uncomfortable on the descents (a little more time to get used to the bike and I’m sure that would go away) but on the flip-side it climbed very well. The tires remind me of the first Surly Endomorphs in that they have a tendency to pull you through a turn, it’s kind of nice in lose turns they can help guide you through. One thing I would change would be the rear cassette spec’d with an 11-32 having the extra gearing of an 11-36 would be nice. The best part about this bike is the price, when most fat bikes are easily over $2000 the Framed Minnesota 3.0 is a great bike to get yourself out and riding this winter. With more and more riders getting out and lots of cross country ski areas opening up their trails to fat bikes, there’s no reason to spend the winter hidden away in the basement ridding on the trainer while watching reruns.